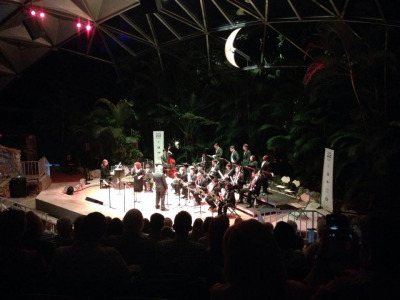 Listen to the irresistible sound of soaring trumpets, wailing saxophones and a swinging rhythm section and vocals featuring the FIU Studio Jazz Big Band. Our 15-piece big band, directed by Jim Hacker, will be sure to captivate you with the essence of new and well-known jazz classics by Stan Kenton, Thad Jones, Thelonius Monk, and more! The big band is one of the most visible artistic groups at FIU. With major performances annually both as a featured group and with world-renowned guest artists, the band has been internationally recognized as one of the premier college jazz ensembles in the world. Invitations to the International Association for Jazz Education Convention, the Mid-West Band & Orchestra Clinic, the Wigan Jazz Festival, the North Sea Jazz Festival, the Quito Jazz Festival, and the Maceo Jazz Festival have taken this world-class group of graduate and undergraduate students beyond the realm of the ‘typical’ college band. Recent local performances include opening night of the inaugural Miami Nice Jazz Festival at the Olympia Theater at the Gusman Theater for the Performing Arts, The Gold Coast Jazz Society concert series at the Amaturo Theater at the Broward Center for the Performing Arts, Larry Rosen’s Jazz Roots concert series at the Knight Concert Hall at the Adrienne Arsht Center for the Performing Arts, and the South Motors Jazz Series in the Banyan Bowl at Pinecrest Gardens.